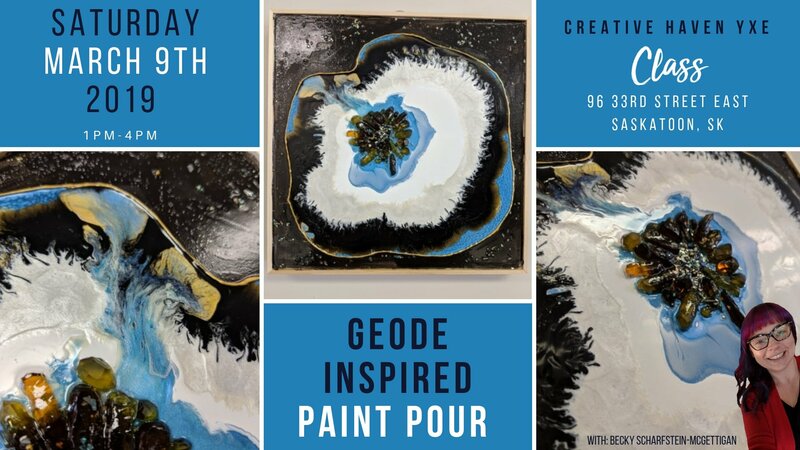 Have you been watching videos trying to figure out how to create these amazing Geode inspired paint pours? The tricky and often very expensive bit is the resin. Well I have a treat for you... Sign up for Creative Haven YXE’s new workshop and learn to create a beautiful Geode without resin. That’s correct, using a variety of Pebeo mixed media products we will create a stunning Geode masterpiece. Becky will teach you all about the amazing and incredibly diverse Pebeo mixed media products. From stunning acrylic paints to fabulous glass oil paints Pebeo has something for everyone. The possibilities are truly endless once you have the basics of these amazing products.